BEIJING — With track and field at a historic crossroads, the IAAF membership on Wednesday elected Great Britain’s Seb Coe president. Coe defeated Sergey Bubka of Ukraine, 115-92, two great champions of and advocates for the sport facing off in an election that reflected on track and field’s past but, more important, its future. A few minutes later, Bubka was elected vice president, along with representatives from Qatar (Dahlan Al Hamad, head of the Asian confederation), Cameroon (Hamad Kalkaba Malboum, chief of the African confederation), and Cuba (the legendary Alberto Juantorena, the 1976 Montreal 400 and 800 meters champ, now a key figure in his nation's sport hierarchy). The 2019 world championships will be held in Doha, Qatar. In another key development, USA Track & Field president Stephanie Hightower was easily elected to the IAAF’s ruling council. She secured the most votes, 163, for the six seats reserved for women on the board, more even than Olympic gold medalist Nawal el-Moutawakel, the IOC member and overseer of the 2016 Rio Games, who drew 160. Hightower said she was "humbled and thrilled to have been selected to serve." The 2021 world championships are due to be staged in Eugene, Oregon; the 2016 world indoors, next March in Portland. “I congratulate Lord Coe on his election as IAAF president, and I am excited to continue to work with him on the important projects that our organization began with president Diack,” TrackTown USA president Vin Lananna said in a statement. Four more Americans won key posts Wednesday, too, signs of emerging USATF strength at the international level: Anne Phillips was elected chair of the federation’s women’s committee, Maryanne Daniel one of the two female members of the race-walking committee. 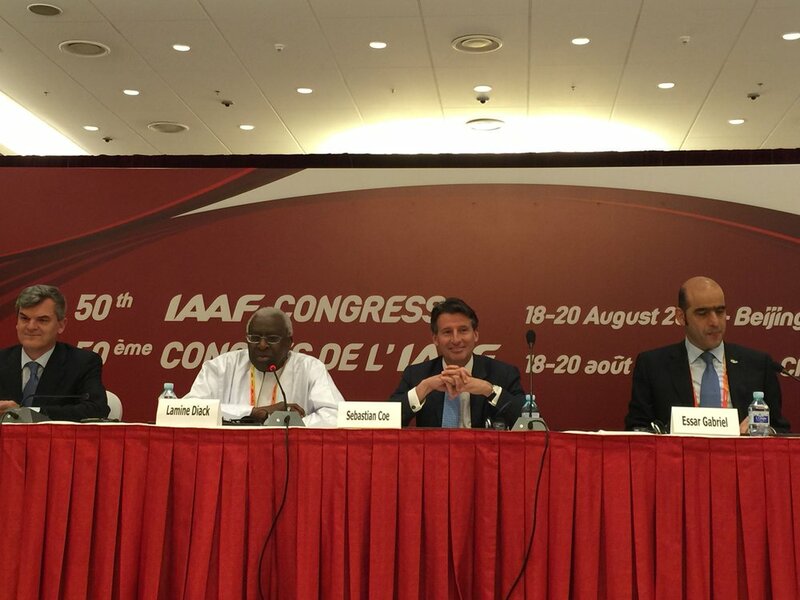 Bill Roe was elected to the cross-country committee, David Katz re-elected to the IAAF technical committee. In all, USATF went an unprecedented five-for-five -- an emphatic rebuttal to domestic naysayers who had been hugely critical of the nominees put forth last December in Los Angeles by the USATF board. Hightower, Phillips and Daniel emerged as the top vote-getters in their categories. “Putting these candidates forward was a strategic decision by our board to be a leader rather than a follower in the IAAF’s new era,” USATF board chair Steve Miller said. Voting for the IAAF’s 27-member ruling council showed the emerging strength of the Middle East in world sports. In addition to Al Hamad, the IAAF elected representatives from the United Arab Emirates, Ahmad Al Kamali, and Saudi Arabia, Mohammed Bin Nawaf Al Saud. Spain’s Jose Maria Odriozola, meanwhile, took over as treasurer from Russia’s Valentin Balakhnichev. The presidential vote total, 34 years to the day after he set a then-world record for the mile in Zurich, 3:48.53, reflected Coe’s strength around the world: Europe, Asia, Africa, Oceania and North America. South America, with its 13 votes, was always a Bubka redoubt. Coe formally takes office on August 31, at the end of the 2015 world championships. The winning margin, 23 votes, also may prove significant as things go forward: comfortable enough for Coe to claim a commanding mandate but not so large as to, in any way, embarrass Bubka. Track and field has, of course, long been the centerpiece of the Summer Games. At the same time, track is increasingly being challenged by, among others, swimming and gymnastics; moreover, survey after survey suggests young people may increasingly be interested in sitting on the couch and playing video games. And track seems chronically to be beset by doping scandals — headline after headline in recent weeks, for instance. During the campaign, Coe aggressively defended the IAAF’s anti-doping efforts. “As you have seen,” he said to delegates from the more than 200 federations just before ballots were cast, “I will always be in your corner. This proved consistent with his all-along strategy, which emphasized not only who he was — relationships in Olympic sport can be everything — but, even more so, a plain-spoken program of rich content. In contrast, Bubka — who also ran a spirited campaign — was more apt to turn to the relationship aspect. Two days before the election, for instance, Bubka sent out an email blast that linked to a photo album from stops along the campaign trail. There is no question — zero — that Bubka, the 1988 gold medalist in the pole vault who for 10 years has been head of the national Olympic committee of Ukraine, is both personable and eminently likable. In the end, however, the IAAF decided it wanted, and needed, more. Time and again, Coe would go back not just to his record of achievement — Olympic gold medalist in the 1500 meters in Moscow in 1980 and Los Angeles in 1984, chief of the enormously successful London 2012 Games — but to the manifesto he put forward several months ago. Broadly, Coe’s vision sketched out for the IAAF a platform rooted in integrity and credibility; creativity and change; enhanced transparency; the imperative of bringing in more sponsors, and doing more with existing corporate partners; increased financial and administrative support to the members; deeper connection with governments; intensified engagement with track’s current and potential audience, notably young people; and a far more robust communication strategy, both within the federation and out. “Everything you do in the sport is underpinned by trust,” Coe said at that post-election news conference. That the time for change is now had become crystal clear. That path has been a slow walk, the last few years of Diack’s presidency seeing the sport launch the World Relays in the Bahamas but otherwise stagnate in significant ways; the presentation of a track meet, for instance, pales in comparison to that of a world-class swim meet. At the same time, Diack leaves the IAAF with what Coe called “an extremely strong foundation.” In 2016, the federation’s revenue projects out to $81.9 million, including a $40 million payout due from the IOC. IAAF reserves at the end of 2014 totaled about $74 million, up $12 million from just four years ago. That said, as a financial report made public Wednesday underscored, the IAAF is hugely dependent on television rights fees — $27 million of its roughly $59 million in income for 2014 — and needs to figure out how to grow that pie. Indeed, that’s the apt metaphor for track and field itself: it’s strong but there is so much sleeping potential there. That, in a nutshell, is the theme Coe tapped into. During the campaign, Coe also had some influential help. It was known in closely held circles that the IOC president, Thomas Bach, would not have minded — not one bit — a Coe presidency, even though Bubka has for several years been a member of the IOC’s policy-making executive board. Same for another key personality in the Olympic and international sports scene, Kuwait’s Sheikh Ahmad al-Fahad al-Sabah. The British government assuredly played a role in supporting Coe’s campaign. Hugh Robertson, the 2012 Olympics minister, served as a lead advisor. Delighted @sebcoe has been elected the new president of the IAAF - an outstanding athlete who delivered the brilliant London 2012 Olympics. Diack, at least publicly, remained studiously neutral during the race. But it was an open secret that he had been piqued two years ago when Bubka ran for the IOC presidency that Bach won; Bubka’s candidacy prevented Diack from publicly supporting Bach. Did any of that linger? Coe logged over 700,000 kilometers in the air since Christmas, criss-crossing the world several times over to meet with track and field officials virtually everywhere. He also said Wednesday about the marathon effort: “I would also like very briefly to thank my teams — because when I was asleep, they were still working hard into the night,” including the veteran strategist Mike Lee, who can now claim another victory. Coe gambled big-time Wednesday, standing only for president. Bubka put his name in for both the top spot and for vice-president. Everyone thus understood at the core that if Coe lost, he was out of town on Thursday, and very likely out of the sport for good. Did track and field want to run the risk of losing his experience, expertise and more? “Congress, friends,” Coe said in remarks before the balloting that would name just the sixth president in IAAF history, dating to 1912, “there is no task in my life for which I have ever been better prepared, no job I have ever wanted to do more and to do with greater commitment.